In this topic you will learn how to embed a Video Cloud video in an Oracle Eloqua landing page. 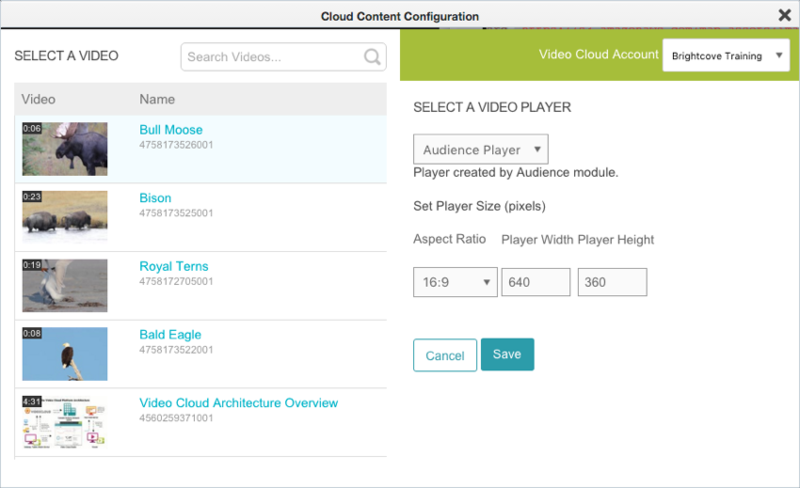 The Audience module provides the ability to add a Video Cloud video to Eloqua landing pages as a type of Cloud Content. Video is added to a landing page from within the Eloqua Landing Page WYSIWYG Editor. To add a video to an Eloqua landing page, the following steps must be performed. Create a landing page in Eloqua. Select a video and player. Eloqua landing pages can be used as a destination for visitors who clickthrough from emails sent from Eloqua. To create a landing page, follow these steps. Note: For complete information on Eloqua landing pages, see the Oracle Eloqua documentation. Sign in to your Video Cloud account. Select the account that has the video you want to use on the landing page. This account must also have access to the Audience module. Navigate to Assets > Landing Pages and then click Create a Landing Page. Click Blank HTML Landing Page and then click Choose. In the left navigation, click Cloud Content. The Cloud Content dialog will open. 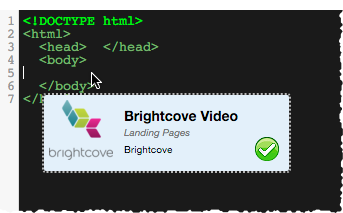 Drag the Brightcove Video object to the HTML page and drop it between the <body> tags. Note: Multiple players can be added to a landing page by dragging and dropping a player between the <body> tags. Save the landing page after adding each player. The Cloud Content Configuration dialog will open where you can select a video and player. The Cloud Content Configuration dialog is used to select a Video Cloud account, video and player. Use the dropdown list in the upper right to select the Video Cloud account to use. After an account is selected, the dialog will update to display the videos and players from the selected account. Select a video to display on the landing page. The 20 most recent videos will appear in the list. Select a player to use. Only Audience-enabled players will appear. Click X to close the Cloud Content Configuration dialog. The HTML will update with the code to embed the player. (Optional). Add other objects to the landing page. Click Save to save the landing page. Give the landing page a name and then click Save.